Smokey. That’s the best word to describe this definitely autumnal soup. After all it has a double whammy of it. The first is the bacon. The second is from a source you may not be familiar with – pan fried cauliflower. and seared chicken on top of the bacon. Pan fried cauliflower is an amazing thing. If you’ve never done it you should. Browning cauliflower in oil transforms it from bland to fabulous. It’s an amazing side dish all on its own. It could be thought that the cauliflower is the star of this soup, but it’s just one of several. Note the word “pumpkin” in the title. If you’ve been reading my blog regularly you’ll probably assume this is some of the free pumpkin I picked up two weeks ago. And you will be right. 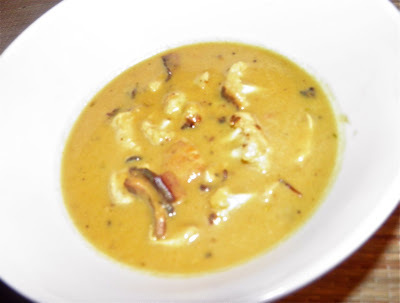 Curry is a perfect companion for sweet vegetables, including pumpkin, in savoury dishes. The base of this soup has to be healthy. It’s a purée of pumpkin, onion, carrot, celery and cloves. 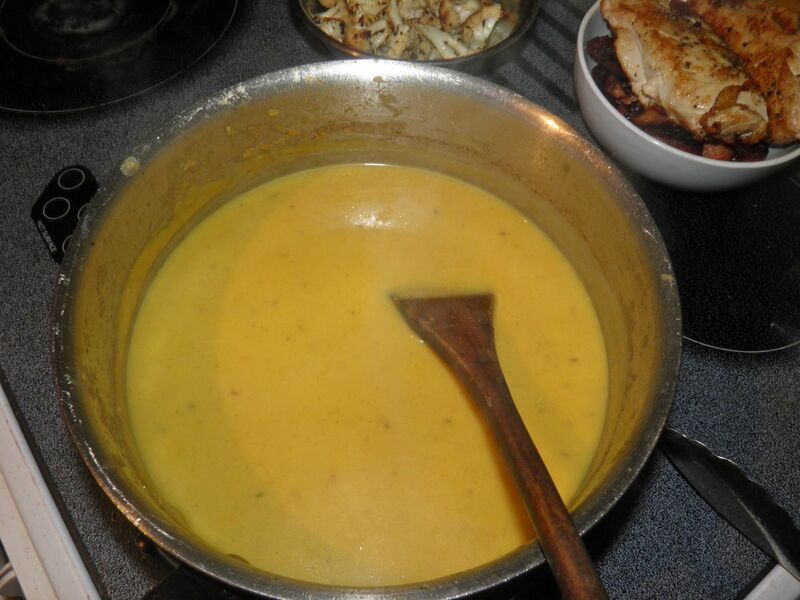 The mixture is then thinned with evaporated milk (2% if you must…) and the rest of the ingredients are added and re-heated. It's actually quite an easy recipe. 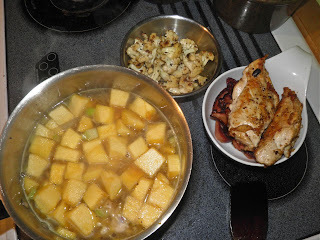 The most work is in frying the bacon, searing the chicken and browning the cauliflower. That's not too arduous, is it? The end result is surprising complex. 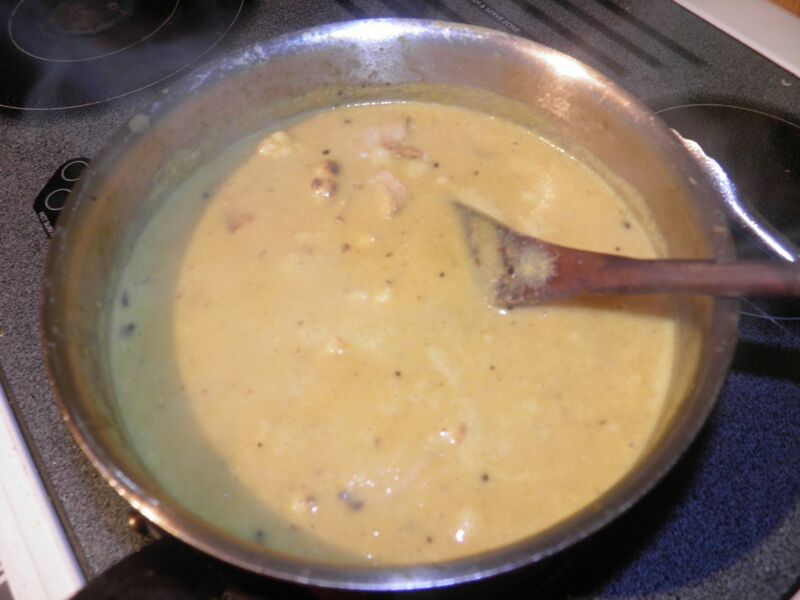 Browned bits of bacon combine with seared chicken and the unmistakable smokiness of fried cauliflower in a creamy curry base. Sound good so far? If anything the leftovers became even more delicious after a day in the refrigerator. This is definitely one to be made again and again. Watch out Fall. Curried pumpkin soul may just about chase you away! Fry the bacon until nearly crisp. Remove and chop or crumble. Sear the breasts in the rendered fat until browned on both sides. Salt and pepper them as they cook. Remove and let rest 10 minutes. Then chop into bite-sized pieces (or shred). Add the cauliflower and sauté until it begins to brown. If necessary add a little vegetable oil. Remove and set aside. After the bacon, breasts and cauliflower are done, sauté the onion, celery and carrot until they begin to brown. Add the 4 cups of water and pumpkin and bring to a simmer. Cook for 20 minutes until all the vegetables are very soft. Purée the mixture. Then add the evaporated milk. 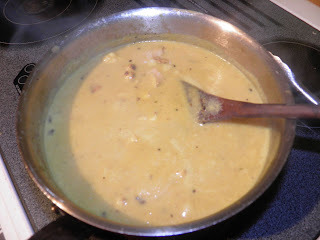 Add the curry powder, thyme, pepper, chopped bacon, chicken and cauliflower. Heat through and taste for salt and curry. Adjust as desired. Serve with warm crusty bread and creamy butter.